Alsace: that area somewhat north in eastern France, adjoining Strasbourg and bordering Germany. People there often speak both French and German. Depending on where they reside in Alsace, and their age, someone may speak Alsatian or Swiss-German or in a Baden-Wurtemburg dialect also. So, wines from Alsace are French but German influenced – or may it better be said that they are German in character but French influenced? The bottles are shaped in the German style after all. And labeling is by varietal, not by area as it’s done elsewhere in France. Meals in Alsace very often incorporate pork made in a Germanic culinary style and sauerkraut (though in a unique style). And there’s sausages and beer! But Alsace is well known for its white wines also (as is Germany). And the wines of Alsace are unique; truly unlike those from anywhere else. They need to be experienced. Varietals may be produced from ten allowed grapes (though if labeled as a varietal, the wine must be made from 100% of the grape named). Only four grapes, however, (Gewürztraminer, Riesling, Pinot Gris and Muscat) are considered “noble”. I’ve long enjoyed the Gewurz and Riesling of Alsace. Lean, and (despite climate change) dryer than their counterparts from elsewhere, they’re focused and exceptionally crisp. But the Pinot Gris and Muscat have been, for me, just occasional enjoyments. 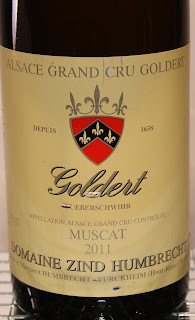 This has changed with the Domaine Zind Humbrecht Muscat Goldert Grand Cru 2011. Muscat is not a grape, but a family of closely related grapes. More than two hundred varieties of Muscat are within this Vitis vinifera species. 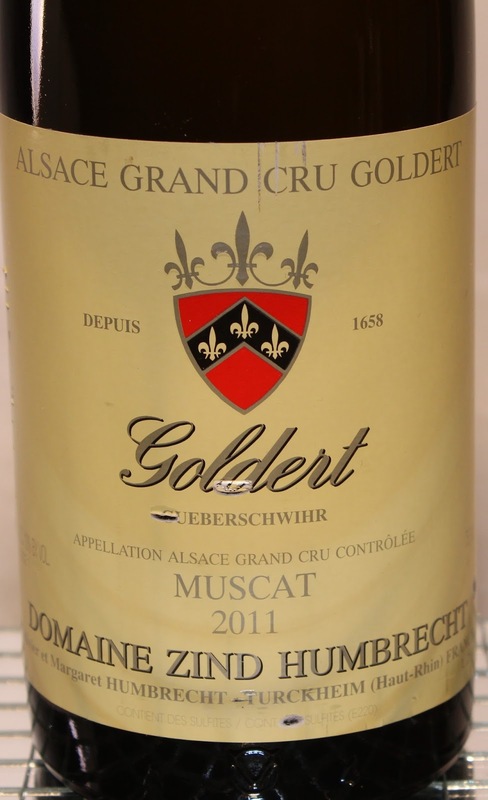 And the 2011 Goldert Grand Cru is 90% Muscat d’Alsace (more commonly known as Muscat a Petits Grains) and 10% Muscat Ottonel. Under direction from Oliver Humbrecht, M.W. , the domaine has been replacing Muscat Ottonel with the Petits Grains as the small berry variety is better adapted to warm vintages while yet retaining its acidity. The nose is vibrant with gooseberry and floral notes of lime blossom and honeysuckle. On the palate, the Goldert terroir moderates the varietal’s fruit with limestone minerality. Intertwined tastes of creamy lemon, then lime. Dry, tart, mouthwatering, yet creamy, then tart again with apple. This is a stage production on the palate. Notes of tomato leaf. Underneath it all: tangerine, cantaloupe and unripe papaya whisper. The texture is slippery while the wine finishes cleanly with lip smacking acidity. Referring to the 2011 vintage, Oliver Humbrecht noted, “It doesn’t take much for this wine to keep some sweetness, but in 2011, the fermentation went slowly to the end leaving little sugars.” With residual sugar of 6.5 g/L, I wouldn’t think that “little”, but on the palate you wouldn’t know it. While some sweetness can be detected, it is indeed just a little – just enough to add texture and balance the acidity. The Humbrechts have been winegrowers since 1620. In 1959, the families of Zind and Humbrecht merged and the label has since reflected that. Their wines consistently impress which accounts for my writing about them so often. And thanks to them, I have a new way of seeing Muscat. I paired this wine with what I had on hand: some sausages and kapusta that I had made the day before, and some other tasties. If you’re in the mood to show this wine in its best light, however, consider pairing it with a terrine or pate, roast pork, white meat poultry, or “white” fish and shellfish in butter sauce, root vegetables; even some Asian stir-fries (provided they’re not very spicy). Follow and like Wine Mizer on Facebook for mini-reviews, industry news and more.